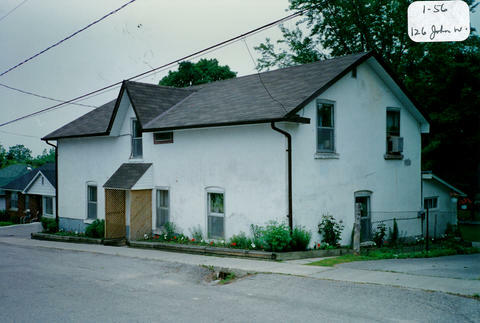 The mid-block building located on the south side at 126 John St. West was built in the 1880’s in the Gothic Revival Cottage style. Originally, there was a back lane for Jim Woods' house and barn next to this house. Pratt lived here many years ago with his wife and two sons. Elgar Houghton bought this house around the time of World War II. He lived there for a time and then he had the house converted into four apartments which were rented. He later sold the building.